Construction was set to begin on the 2.7-acre Pier 55 off West 13th Street in the summer of 2016. MEATPACKING DISTRICT — Billionaire Barry Diller has resurrected his plans to build a controversial $250 million island park on the Hudson River now that his opponents have been bought off with a promise by the governor to complete the Hudson River Park in its entirety. The decision came amid “so much importuning, from so many people, all with the same sentiment: they all express their hope that we not give up and instead find some way to proceed with building Pier55,” Diller said in the statement. “In these last weeks I began to think that we should not let it go, and that I would try to put aside the disappointments and difficulties of these last years." 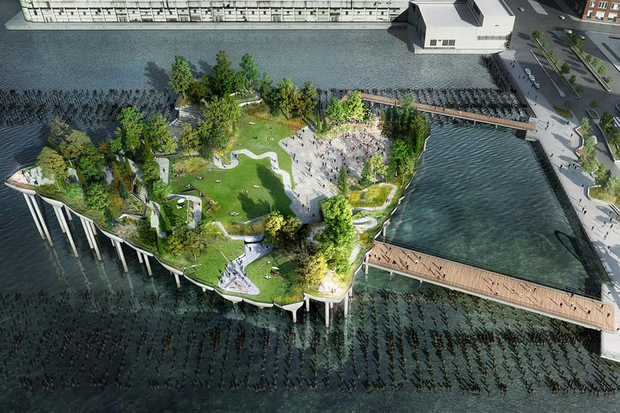 In September, Diller and the Hudson River Park Trust announced the billionaire had scrapped his plans to build a 2.7-acre island park called Pier55 along the Hudson River, below 14th Street. The project had won the support of the local community board and politicians including Mayor Bill de Blasio and Gov. Andrew Cuomo. But Diller said it began to drain his finances as it faced lawsuits from opponents including the City Club of New York, which claimed it was an unauthorized use of public park land and hadn’t undergone a proper environmental review. In a statement Wednesday, however, Cuomo said City Club had agreed to end its legal battle against the project, adding that he planned to make sure the Hudson River Park is “completed” by the end of his tenure as governor. The state’s 1998 plan for the park was supposed to be completed by 2003, but the park is still unfinished, Cuomo explained. On Wednesday, City Club lawyer and founding member Richard Emery told DNAinfo New York the governor’s promise swayed the opposition. “He made an offer that we really couldn’t refuse — he offered to do what nobody’s done in 20 years, which is finish the park and protect the Hudson River. That’s a trade-off that we think is worth making, notwithstanding our success in opposing [the project],” he explained. “And so it was a pragmatic trade-off that we believe is great for the Hudson, great for New York City, and great for the fish and the estuary, literally,” Emery added. Cuomo’s promise will ensure that work on unfinished parts of the park — like the crumbling Pier 40 — will move forward, he said, noting that certain parts of the park will now get the historic preservation they need. The City Club's main objections to the project had included the “lack of public participation” and the “secret nature” of its planning, Emery said. “We’re basically saying that we’re going to hold our nose and deal… with this project, for the betterment of the entire project as a whole,” he explained. “We will work with all stakeholders to figure out a way forward and bring this incredible project to fruition,” she said.